The English language is old enough to make us wonder where do all its spelling and grammar rules come from, isn’t it? Nowadays we can easily study some particular points of the language history, but we do not always have enough time to do it. The most misspelled words in English are not pulled from college term papers; they are in everyday writing. While reading through this list of the 15 most commonly misspelled words (when your nose begins to bleed, and your eye starts to twitch), remember that there is an easy solution: spell check. You can easily download full-size poster version of the infographic here. After you have double-checked your texts in our spellchecker, let’s learn the rules of some of the correct writings from the list. The first standard of the correct spelling is to know the right pronunciation and the reading. If you are the ESL student, this point should be familiar to you as you had to learn the alphabet with its different sounds. The changes made in the pronouns don’t follow the “E” before “I” except after “C” rule as they have their own origin of spelling. “Behaviour” and “Behavior” are both correct, but in two different countries. The first is available in the UK, but the second is in the US. British variant suggests going to some history lessons. Meanwhile, if we had “L” in the end as in “real” word we double “L”. The last point for you to study is the list of the “Wh” questions words: who, whose, what, which, when, why, where. 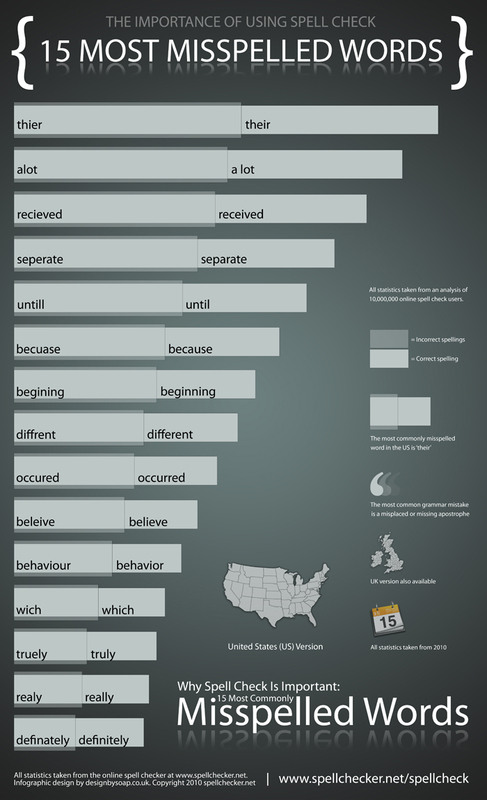 As this infographic proves, the most commonly misspelled words are the ones we use every single day. By taking a minute and spell checking your work, you can avoid these blunders and, in doing so, appear more professional in a business email, come off as more caring and considerate in a birthday card (because you took the time to perfect and polish your writing), and simply be viewed by the world at large as a more educated, conscientious individual. Spelling matters in real life, not just in English class! I hope that I gave you enough information to study today, and to scratch your head while looking through the language history. Why Do People Think Summer Studying is a Good Idea?